Lancaster Online reports that State Representative Neal Goodman (D-Schuylkill County) recently introduced House Bill 484, which would increase penalties for any low-life who would steal another hunter’s trail camera. The bill introduced by Mr. Goodman, who must be a deer hunter, would make the theft of a trail camera a first-degree summary offense, which carries a fine of up to $1,500 and potential jail time of up to 3 months. Also, and this is the best part, anyone convicted of stealing a trail camera would have his hunting license revoked for a year. If it were up to me, I’d go with a mandatory 3- or 5-year hunt license suspension. Nothing worse than stealing! HB 484 has been referred to the Penn. House Game and Fisheries Committee, where it awaits legislative action. I cannot imagine any push back, but only support for it. This entry was posted in Big Bucks, BigDeer, Deer Hunting, Hanback, Trail Camera Photos, whitetail deer by admin. Bookmark the permalink. I certainly have! Had one taken from the middle of a 1000 acre block of private property that only has public access thru my right of way driveway 1/4 mile off road. 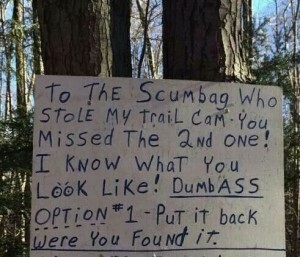 How that thief got past the other dozen or so trail cams hanging at the time still baffles me. Lately when in doubt of theft I hang them with the help of a climbing tree stand sometimes I will indeed place a non working second camera at ground level with a lock on it….makes them work for cam and takes different angles with second camera. Took photos of one thief to local magistrate said she could not do anything cause the thief was were his hood up and sun glasses on in my second cam photos.